Automotive direct mail services Coyle Print Group Inc. Automotive direct mail pieces and service are just one of Coyle Printing's specialties. If you're like most people who manage print production, you can't possibly research the thousands of suppliers that serve the print buyers of America, nor would you want to. First, it's not a productive way to spend your time. Second, it will cost less to have the print production experts at Coyle do the work for you. Coyle Print Group was formed by a 14-year-veteran of the commercial printing industry. Automotive direct mail: We're a print production company that works on behalf of print buyers with a staff that includes experts in every printing process; they will assist you with any application or end use. Really, it's okay to "pass the buck" to Coyle; we welcome every single one of your projects. 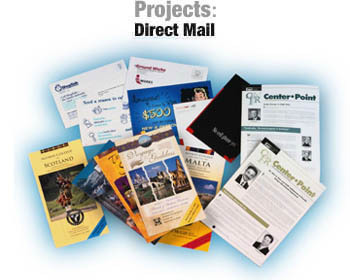 Automotive direct mail pieces - It's our specialty. And our ability to take on a portion of your project or the entire project is part of what makes us different. We're also different because we believe in human interaction and one-to-one service with clients and suppliers rather than faceless self-service, which is often when slip-ups occur. We communicate complex specifications, answer questions, and solve problems online by phone or in person -- whatever it takes. Whether you're creating direct mail, POP, packaging, catalogs, labels or anything in between, Coyle has the resources and expertise to handle the production work for you. Give us the details and we'll research our nationwide network of pre-press, printing, finishing, and fulfillment facilities and find the right match. Coyle Print Group handles every aspect of automotive direct mail from data processing to fulfillment. We manage consult through the design phase, supervise the production and manage fulfillment and distribution on projects from self-mailers to multi-component customized and / or dimensional mailers.